Early in 2014, I noticed my waist was expanding without explanation – my diet hadn’t changed and I wasn’t pregnant (After having two kids, I didn’t think much about my “baby belly,” but it seemed larger than reasonable). Then I noticed that when I lay down in bed, my stomach didn’t flatten out like it used to. Also, my abdomen seemed a little tender. I made an appointment with my OB/GYN (gynaecologist), thinking it was possibly a cyst. She ordered an ultrasound, which revealed a large tumour. My right ovary wasn’t visible on the ultrasound and my left ovary was “enlarged and suspicious”. When I asked her if it was cancer, she said, “It’s a possibility”. She said she wasn’t comfortable treating me and wanted to refer me to MD Anderson in Houston, Texas. She also ordered blood work. When the results were in, two tumor markers were elevated, which increased the likelihood I had cancer. I then saw my primary care physician. He had to officially make the referral to satisfy our insurance company. He also sent me immediately for a CT scan of my abdomen and pelvis. That afternoon, he called and said, “It doesn’t look good. It looks like ovarian cancer”. I was 35 years old and my children were nine and five. My husband and I were building a house, I was homeschooling our children, held two offices in our local beekeeping association, took care of a large flock of chickens (and a few ducks and guineas), had recently split my three beehives into five, and had just started my spring garden. I thought I was relatively healthy, then THIS. My worst fear, second only to losing a child, was materializing. On my first visit to MD Anderson, I saw a gynaecological oncologist. She sent me for a CT scan of my chest to check for involvement there. We discussed treatment. Most likely she would recommend 3 rounds of chemo to try to shrink the tumour, surgery, and another 3 rounds of chemo. She also ordered an EGD and colonoscopy to rule out cancer in those areas. Those came back clear. The only thing of note was that my appendix was inverted (surely due to the massive tumour pressing against it!). Next was a biopsy of my omentum. The biopsy report said “metastatic, well-differentiated mucinous adenocarcinoma”. It also said, “The histology and immunoprofile favours an appendiceal primary but metastasis from other sites cannot be excluded”. That was the first time I’d ever heard of appendix cancer. I didn’t know whether to be relieved or more worried. I was referred to Dr. Keith Fournier, an appendix cancer specialist. I read just enough about appendix cancer to scare me. I read that about 500 to 1,000 people are diagnosed each year in the United States¹. I also read a blog written by a woman whose sister died from appendix cancer. She detailed her long battle and painful demise. I decided not to read anything else. I’d spent two months thinking I had ovarian cancer and researching all kinds of treatments, side effects, and statistics, and I just couldn’t handle any more. I decided to enjoy a few days of “ignorance is bliss” and wait to see what Dr. Fournier said. Dr. Fournier reviewed my tests and believed it was appendix cancer. He said if it didn’t originate in my appendix, it started in my peritoneum and treatment would be the same. I was shocked when he described the surgery. He said it typically lasts 10 to 12 hours. He listed all the organs that would probably be removed, others that might be, and said I would have a heated chemo wash (HIPEC), during which they would rock me for 90 minutes. I would wake up with a temporary feeding tube and, possibly, an ileostomy (also temporary). The average hospital stay is 22 days. I couldn’t imagine losing so many organs and being in the hospital for so long. And I’d never been away from my children for more than a few days. I wish I’d found the PMP Facebook groups before my surgery. Even though Dr. Fournier sounded optimistic that he could remove all the cancer, I really didn’t know whether I’d live through it. I really wondered whether I’d be there when my son lost his second tooth or for my daughter’s 10th birthday. If I’d found the groups, I’d have been much more at ease. There were so many others, some twice my age, who’d had the surgery and gotten on with their lives. I found the Facebook groups a month or more after my surgery. The other members have been wonderful sources of information and support. I had the aptly-named “mother of all surgeries” Wednesday, June 4th, 2014. My husband was sick (lousy timing, I know! ), so my sister-in-law drove me to Houston Monday and accompanied me to all my pre-op appointments on Tuesday. My parents met us at the hospital early Wednesday morning to check in. I can’t imagine what that day was like for them. I was in surgery for 13 hours and they didn’t get to see me for another two or three hours. They removed my appendix, right colon, ovaries, uterus, gallbladder, omentum, peritoneum, 1/5 of my diaphragm, the large tumour, a small tumour we didn’t know about from the scans, and scraped disease off my liver and bladder. I scored 29 out of 33 on how much cancer was present when they opened me up. Thankfully, the surgery went very well. Dr. Fournier was able to remove all the cancer he could see. I didn’t need an ileostomy, but I woke up with an iv (actually, I think there were several), catheter, epidural, chest drainage tube, feeding tube, stomach drainage bulb, and an incision from breastbone to pubic bone. I was given four units of blood the night of my surgery and two units a few days later. The tubes were gradually removed, last of all the feeding tube — two and a half months after surgery. I spent two weeks in the hospital and was released to a motel. A few days later, I went back to the hospital with severe nausea and vomiting. I stayed a few days, went back to the motel for a week, and was able to go home July 2nd. I was amazed at how tired and weak I was after surgery. They had me up and walking the next day, though. At first, I could barely do one lap around the nurses’ station. The first time I took a shower, I couldn’t lift my leg high enough to dry it off and I was exhausted afterward. I spent a lot of time sitting in bed or in a chair reading books and magazines and watching MacGyver. The pain was mostly under control and I felt fairly comfortable sitting. Lying flat was very uncomfortable for about three months, so I slept propped up on pillows. My husband, parents, and sister-in-law spent time at the hospital and motel with me. They brought my kids to see me a few times. Several of our friends stopped by for visits, too. About a week after surgery, my hair started thinning. I had cut it the day before surgery so it would be easier to take care of while I was recovering (it was long enough to sit on before I cut it). Dr. Fournier had told me I’d lose some, but not all, of it. He was right. I didn’t lose all of it, but I lost a LOT. It thinned for about four months. There were places it was so thin you could see my scalp. I got a free wig from the American Cancer Society and that made me feel better about myself. I didn’t look so much like a cancer patient. It’s now growing back and, while it looks terrible if I wear it down, you can’t see my scalp when I have it in a small bun. My recovery has gone well. In late July, one of my beekeeper friends helped me check my hives and harvest honey since I was restricted to lifting no more than five pounds. I went to Mom’s Night Out during the first week of August. The next week I attended our monthly beekeeping meeting. My husband was still driving me at that time, but I started driving myself the next week. I took the kids to a birthday party and a science club meeting. In September, we spent a day at the zoo. We attended a couple of local functions and field trips. My husband took a day off in October and we went to the Texas State Fair. I was tired and sore the next day from so much walking, but we had a good time. My 6-month scan in December showed no evidence of disease and my tumour markers were back down to normal levels. My doctors were pleased with my progress. Their only concern at this point is that I gain some weight since I dropped down to 95 lb (I lost a total of 50 lb, about half before surgery and half after). I was told to expect about nine months to full recovery. It’s now been nine months. I still have nausea now and then and I get tired sooner than I would like. I went to the ER on New Year’s Day and was admitted with a small bowel obstruction (we managed to resolve that without more surgery). Otherwise I’ve been doing really well. Homeschool is in full swing (and has been since August). I’ve been playing table tennis each week. With some help from my parents, I’ve started planting my spring garden. I’ll be starting splits of my beehives next month and will be manning the bee table at some events soon. Life is good! I consider myself fortunate in many respects. I was ultimately relieved I had appendix cancer and not ovarian (or colon, stomach, etc) and I had the “good” kind. My doctor said I have a 72% chance of being alive in 10 years; those are great odds for a cancer patient. One of my doctors guessed that I might have had six months without treatment. I’m happy that I was a candidate for surgery and HIPEC. Without it, I’d probably be dead right now. I was also relieved that I didn’t need systemic chemo. I wasn’t enthusiastic about HIPEC, but at least it was over in 90 minutes rather than lasting for hours at a time, week after week. I’m extremely happy it was me and not another member of my family, especially one of my children, who was diagnosed. I don’t know whether I could have handled watching one of my babies go through what I did. I told my husband I was glad it wasn’t him because he’d have had to drive himself to Houston! I don’t like riding in Houston, much less driving in it! It was also better for me to have cancer than either of my sisters. One lives in California and works full-time, as does her husband, to pay off out-of-state student loans and for the purchase of their home. The other is a single working mother. I can’t imagine how either of them would have managed with a cancer diagnosis. The same goes for my sisters- and brothers-in-law; I don’t know what they’d have done. And the timing couldn’t have been better. My husband is a college professor and was able to take the summer off to drive me to appointments and help me after surgery. My recovery was made much easier by the on-line meal schedule a friend created. People brought us meals for two months after I came home. Another friend set up a fundraiser to help with the costs of my medical and motel bills. I’ve been blessed with loving and generous family and friends. I’m thankful I’ve been given more time with them. My cancer could return. It might kill me one day. But it might not. Nobody knows. I’ve been blessed with good health otherwise, a wonderful family, and great friends. I’ll be 37 in a couple of months. My husband and I will celebrate our 12th anniversary this year. We’ve been blessed with two healthy children. Our home isn’t fancy but it’s ours. We have food on the table and clothes on our backs. We’re happy. Not everyone can say that. I’ve known people who didn’t live to see 30. I know people who were unable to have children and people who’ve buried children. I’ve watched people die from various kinds of cancer and suffer from other diseases. I’ve seen little kids fighting cancer. There are people starving to death. If cancer kills me in 10 years or if I die in a car crash tomorrow, I have nothing to complain about. My life has been a wonderful experience and I intend to make the most of it for as long as I can! 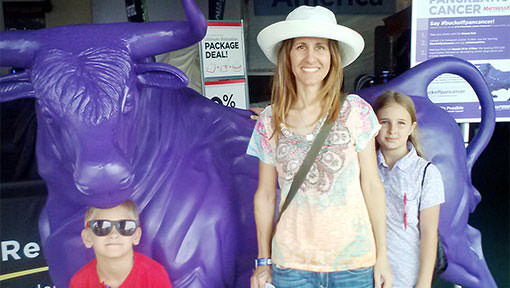 Rachel was 35 years old when she was diagnosed with mucinous adenocarcinoma. Her children were nine and five. 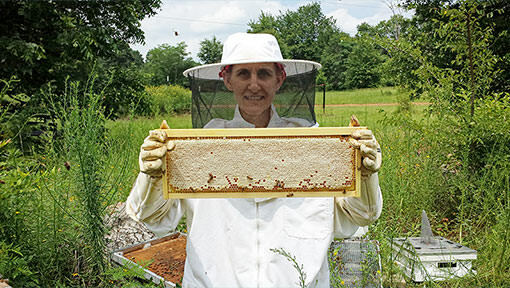 She is a beekeeper and home schools her children. She was treated at MD Anderson. ¹According to the American Cancer Society, there are about 221,200 new cases of lung cancer and about 231,840 new cases of invasive breast cancer each year in the USA. I love using fancy punctuation; the semicolon is probably my favorite. Rachel is my favorite semicolon EVER!!! You were a great source of support throughout my diagnosis and recovery. And I’m gonna brag on you because you brought us meals two, maybe three, times. I’m thinking it was three. I love you, too! Rachael, I am touched by your story. Mine is very much similar with yours. I had my surgery and HIPEC in last July as well. My surgery was in Sloan Kettering, New York City. I have a similar diagnosis like yours except that my doctor found one area in my omentum had moderately differentiated cells. He suggested Systematic chemo treatment after the surgery. And I did that. I completed the chemo a month ago. I am just like you enjoying the life surrounded by the love from family and friends. Nancy, I’m so glad you’re doing well! I know there are several people in the Facebook groups who have had systemic chemo; it depends on the pathology. I hope it went well for you and I’m glad you’re done with it 🙂 Keep on enjoying life! I’m so, so pleased your story has a different outcome (at least so far – I know we can’t be complacent with this sort of cancer) than my husband’s. We lost Nicky to mucinous adenocarcinoma of the appendix two weeks ago, after a two year battle, including the mother of all surgeries and HIPEC. He was 34 and we have a 4 year old son. I wish you and your family all the love and strength in the world and hope that you get many more years together. Kerry, you have my condolences. You husband’s amazing blog was shared in our support group. It is very funny. Please feel free to add it to our list of blogs. Kerry, thank you for the kind words. I’m so sorry about your husband. It’s a horrible disease. I’ve read some of your husband’s blog. He was a gifted writer! Rachel, thank you for sharing your story. I was just diagnosed with mucinous adenocarcinoma on Tuesday. My appointment with the surgeon and medical oncologist is Monday – not soon enough, if you ask me. I am absolutely terrified – I have an 8-year-old beautiful biological daughter and 21-year-old beautiful step-daughter, as well as my amazing husband – the love of my life, my high school sweetheart. I have to survive this for them. Your story gives me hope, which I need in spades. I will keep you in my prayers for a long, healthy life. God bless you and your family, Rachel. Ellen, I’m so sorry I didn’t see your comment sooner! I guess I thought I’d get a notification when there were comments. It’s certainly a terrifying situation. I hope you’re doing well and on the road to recovery. Dear Rachel, the story about your survival of a PMP diagnosis was so well written and filled with hope — something we all need when confronted with this rare illness. You sound like a delightful young woman, and I pray that God will shine his golden light upon you and keep you well for the sake of your husband, your children and yourself. There are so many similar themes to our individual stories — the expanding, unexplainable girth, tenderness in the abdominal area and other symptoms that could be attributed to other diseases. I’m relieved for you that it was not ovarian cancer because of a more difficult prognosis. I, too, noticed an expanding waistline during the winter of 2015. By spring, I was having trouble zipping my jeans. Two visits to my PCP’s office were a waste of time. I saw two nurse practitioners. During visit #1, I was told “possible lactose intolerance. Swear off dairy for a while.” During visit #2, the nurse poked my very hard belly and shrugged her shoulders. No tests were ordered. Nothing at all was done. Not even a mention that my doctor should be involved. I live in the Boston area where medical care is topnotch, so in hindsight this is absolutely unfathomable. It wasn’t until I could only zip my jeans two notches (July 2015) that I knew something was truly wrong. I went back to my doctor and this time tests were ordered, beginning with an x-ray, the an ultrasound, then a CT scan. (My insurance company insisted on this order of tests.) Sure enough, there was “something” inside my abdomen, and exploratory surgery was needed to figure out what it was. My doctor sent me to Mass. General and a gyn oncologist handled the operation four days later. Twelve hours, 21 pints of blood. When she had me open, she and the other doctors didn’t know what they were dealing with…only that I was filled with a mucinous jelly and that I had a tumor whose origin could not be determined…either the stump of my (removed) appendix or the remnants of my right ovary (I am in my late 60s and had my appendix removed years ago along with a nearly complete hysterectomy). When I asked her, she said it was the size of “triplets at term.” For the next 47 days, I was at MGH recovering. A second surgery had to be done two weeks after the first due to a kink in my bowel. Then, I started to get better a little at a time, even though I had an NG tube, nephrostomy tube and other medical horrors to deal with. An ileostomy was reversed during the second surgery. Thank you, God. My only concern is that I did not have HIPEC treatment, and this is because the doctors did not know they were dealing with PMP. I plan to ask if people are ever re-opened to administer HIPEC post-surgery. You mentioned that it was good that it was YOU who got cancer, not your children, nor your husband nor your sister or other relatives. I could not help but think how your thoughts echoed mine. The suffering I went through all the way through October was just terrible, yet I can recall the words I spoke to my husband as we drove through Boston to get to my appointments. I said, “I’ll do it. I’ll suffer so you won’t have to. I’ll take on the suffering for both of us.” When I told this to my friend later (we are both committed Christians), she said what I was experiencing was “redemptive suffering.” I had never heard of this before and looked it up on the Internet. Sure enough, I now believe that is what I was doing. Taking on suffering for my husband so he would not have to. I don’t know if this is a fact, but it seems odd that I would say these things on the way to Boston when I was so desperately sick and in pain. I knew nothing about redemptive suffering at the time. Now, here we are in April 2016. I feel aces. I really do. I’ve been a tap dancer all my life and have gone back to that. I also work out at home (or at the gym) with Leslie Sansone walk at home YouTubes. And we just returned home from Mexico after a week on the Mayan Riviera. Life IS good. And, as you said, we have so much. I give God thanks for everything — my return to good health, the food on our table, clothes on our back, even hot water in the shower. I take nothing for granted. I will not lie and say that I am 100 percent sure this illness will not recur. It might. It might not. I think the important thing to focus on is living in the moment — enjoying your family and taking care of your bees, for instance. I work as a professional writer, so my living in the moment has to be focused on listening to other people and writing about them and finding interesting topics to write about. I also love exploring the world and am thinking about what I want to see. Most important is to share our love with others and help wherever we can. I now look for ways to help people, whether it’s to offer someone a ride to the airport or cook a dinner for them. Wish you well. Thanks a lot for sharing your beautiful story.